Homemade Cream Cheese Danish Recipe that tastes super fancy, but takes just minutes to make! 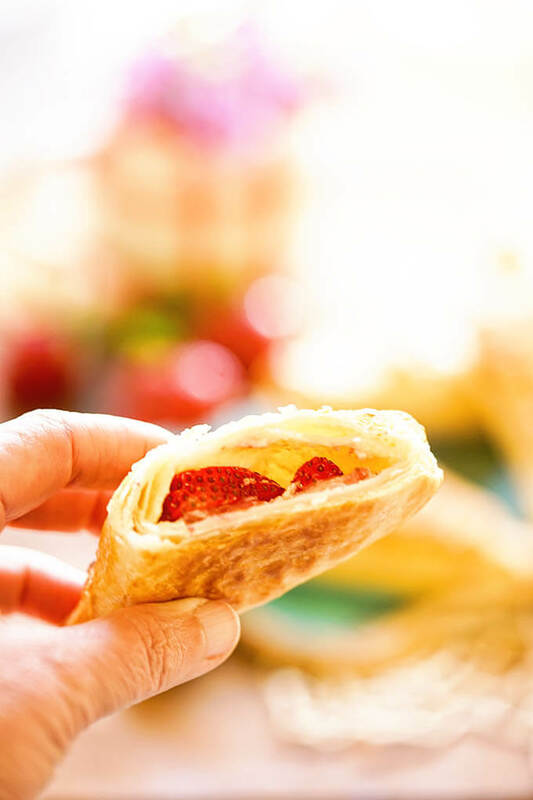 Using store-bought puff pastry and stuffed with sweet cream cheese and tangy berries. These are over-the-top delicious! Sweet and delicious this cream cheese danish recipe couldn’t be any easier! Does food inspire memories? I associate so many memories with food and this one especially makes me smile! When we were kids Sunday mornings meant Church. We would go as a family, Mom and Dad, Don and I and Grandma too. We would go to Sunday school and then church. Once a month there would be just singing and we could request our favorite song. My brother Don would always request the hymnal “Church is Finally Over” and the gal that led the singing would shake her head and dutifully turn to that page while Don would snicker and we would all giggle. On Communion Sunday, Don and I would be sure to sit on either side of Grandma when they passed around the little cups of wine. Once Grandma had the wine she’d often hold it in her right hand. That was also the wrist she wore her watch on. Don would say, Grandma, what time is it? And she’d turn her wrist to look at the clock and pour the wine on her lap. We’d laugh and BOY did we get in trouble! Because the day started off as a mad dash, we’d have a snack when we got home. Often it was cream cheese danish! 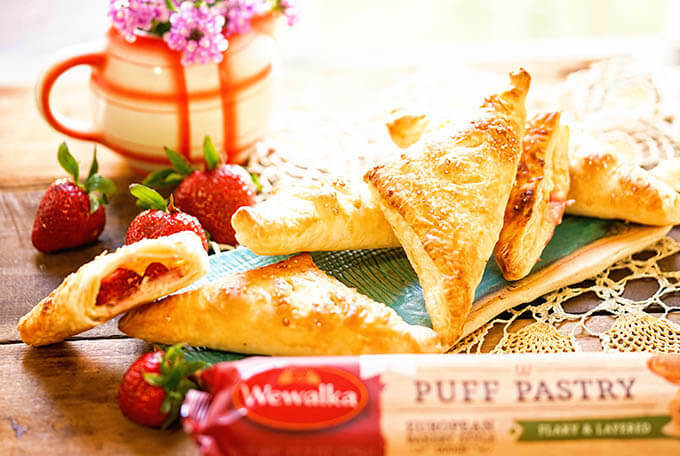 Using store-bought puff pastry Cream Cheese Danish is easy to make! Before I get a whole lot further, I want to remind you we have an amazing giveaway associated with this post so be sure and head to the bottom and enter the giveaway! Is Danish pastry the same as puff pastry? Optional fillings for Danish Pastry? The sky is the limit! You can make danish that is sweet or savory. Here are some great ideas to be sure to get your stomach growling! Rinse the berries, drain them well and set aside. Next add the cream cheese, lemon, sugar and vanilla to a mixer. Beat until smooth and creamy. 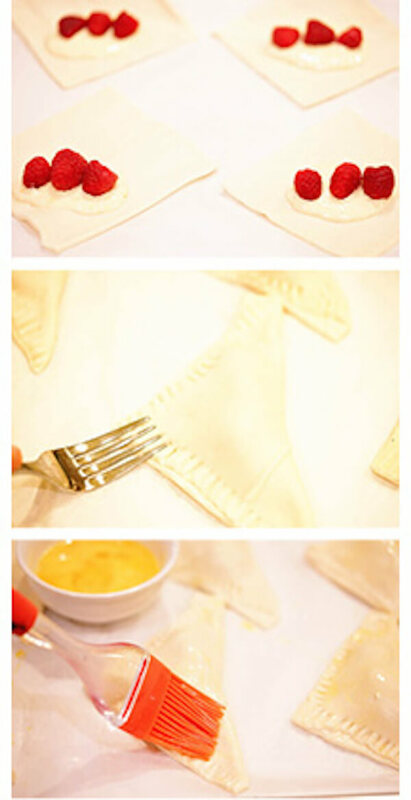 Unfold the puff pastry and slice into six equal squares. Add a spoonful of the cream cheese mixture to the center of each square. Top with 3-4 raspberries or slices of strawberries. Fold the square over and seal well with a fork. Beat an egg and brush over the tops of each pastry. Sprinkle with raw sugar for a little extra sweetness! Place on baking sheet. Bake until puffy and golden. Danish Cream with strawberries is a great option! More of my favorite quick and easy breakfast recipes! Peanut Butter Honey Sandwich – easy and delicious, always perfect for breakfast! 3 Ingredient Oatmeal Breakfast Cookies – cookies for breakfast? Absolutely!!! Peanut Butter Banana Chocolate Smoothie – I just couldn’t tell you how amazing this is!!! Grandma Few’s Super Moist Banana Nut Bread Recipe – This family recipe is soooo good! A couple of things before you go! Don’t forget to enter the giveaway below, I’d love YOU to win! 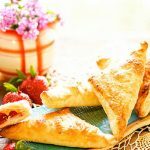 Homemade Cream Cheese Danish Recipe - take a shortcut and use store-bought puff pastry! 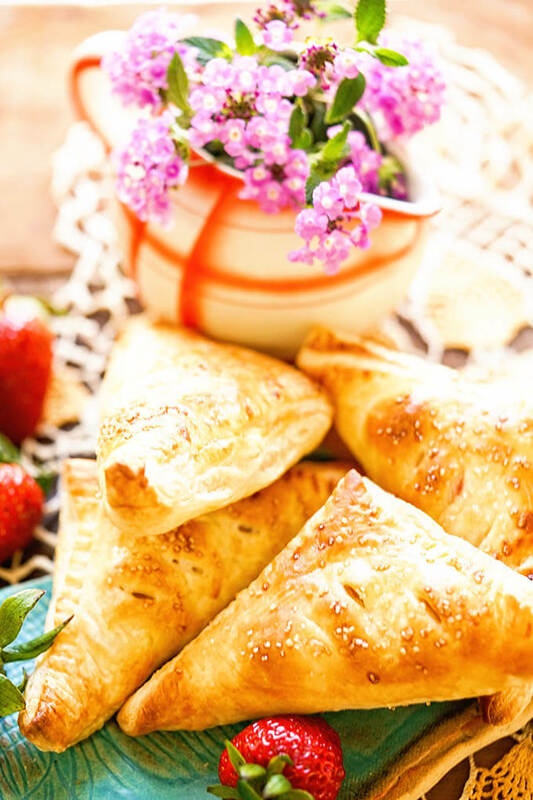 Stuffed with sweet cream cheese and tangy berries, these are over-the-top delicious! Rinse the berries, drain well and set aside. Add the cream cheese, lemon, sugar and vanilla to a mixer. Beat until smooth and creamy. Unfold the puff pastry sheet and slice into six equal squares. Add a spoonful of the cream cheese mixture to the center of each square. Top with 3-4 berries. Brush with an egg sprinkle with raw sugar for a little extra sweetness! Place on baking sheet. Bake for 8-10 minutes until puffy and golden. 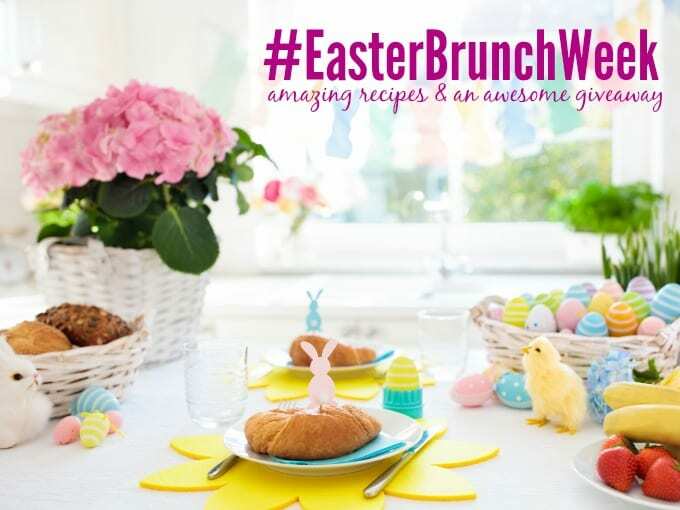 Official Rules and Conditions for the #EasterBrunchWeek Giveaway: One grand prize winner will receive a prize package including items from Eggland’s Best, Grosche, Hamilton Beach, Rhodes Bread, Silpat, Stonyfield and Wewalka. Open to US residents 18+. One (1) winner will be chosen. Prize must be claimed within 48 hours of announcement or a new winner will be drawn. The prize will be delivered electronically. All entries will be verified. This giveaway is in no way associated with Facebook, Pinterest, Twitter, Instagram, Rafflecopter, or any other entity unless otherwise specified. Giveaway ends 4/20/2019. Enter using the widget below. Comment each day for even more chances to win! These look super tasty! I adore Wewalka dough, and it’s so easy to make danishes with them! The Danish looks Sooo Delicious. Thank you Colleen and no cooking? Good for you – going out works too, enjoy! And good luck in the giveaway! Cream cheese danishes are my favorite and now I can make them at home! thanks so much for this!